Dark facial hairs can be embarrassing, but you don’t have to live with unsightly facial hair. Dermatologists provide permanent hair removal services, or you can try removing or bleaching your facial hair at home. Here we present a few simple recipes on homemade bleach for face hair. Waxing, shaving, tweezing and epilating – you’ve tried it all. But it’s just too much effort. And such a waste of money too, because eventually, it’s all for nothing. That is why homemade bleach for face hair is considered as a go-to solution by many. It is a fact that women have to deal with facial hair just like men. To some, facial hair not only looks unpleasant but can also cause embarrassment. Unwanted facial hair, if in excess, can also make your face look darker than its natural shade. 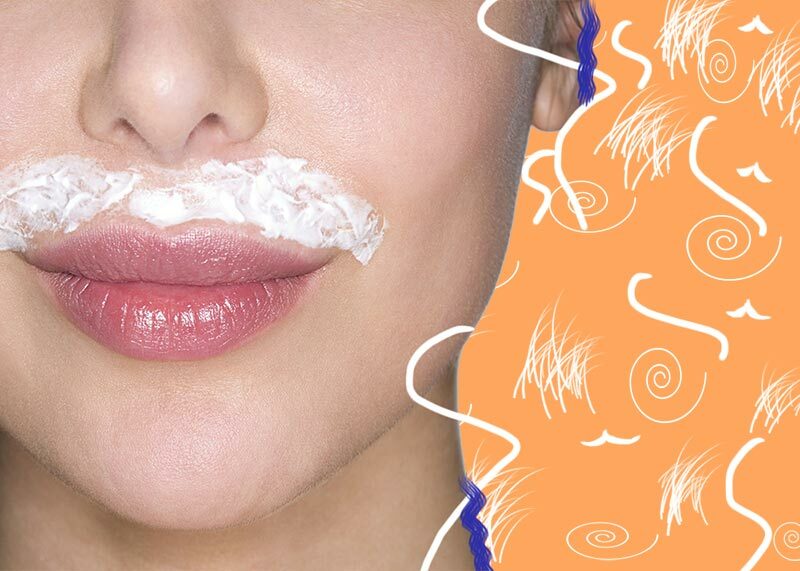 There are many ways to get rid of facial hair! You can bleach if you want to avoid the pain, and wax if you want to get rid of them entirely. But, many of the methods to get rid of facial hair come with their own side-effects. Use hydrogen peroxide to lighten the hair on your face. You’ll need to mix six per cent hydrogen peroxide with ammonia to make the facial hair bleach. It is suggested to mix 10 drops of ammonia with 15 grams of hydrogen peroxide to create the bleach. Apply the mixture to your dark facial hair immediately after mixing and leave it on for 20 to 30 minutes before rinsing. If the bleach does not lighten your hair to your liking, you can repeat the process the next day. Peroxide and ammonia are strong chemicals, so don’t use them to bleach your eyebrows or eyelashes. Perform a test patch on a small area of skin to make sure you won’t have a negative reaction to the bleach. Take a potato and slice it into the half. Apply some water on its surface and rub it on your face. It will lighten the colour of your facial hair and will make your skin soft and supple. Just try this simple homemade bleach for face hair and get rid of facial hair easily. This is a pretty easy process of homemade bleach for face hair. Take a slice of tomato and rub it on your face. Do this for five minutes, and then wash your face with lukewarm water. In a few days, you will notice the colour of your facial hair will lighten. Tomatoes can lighten your facial hair naturally and quickly. Use the pulp from a papaya fruit to lighten the hair on your face. It is suggested to mix papaya pulp with milk to form a thick paste. Apply this paste to dark hairs on your face and massage the mixture into your skin for 10 minutes. After massaging, wait another five minutes before rinsing the paste from your skin. Chickpea makes excellent gravies. Did you know it also doubles up as a bleaching agent? Well, the secret’s out, so might as well tell you. Make a paste using 2 tablespoons of chickpea flour and 1 tablespoon milk (or milk cream – malai). Add 1 teaspoon turmeric to the mix. Apply the paste to dark facial hair. Wash it off after 15 minutes. Repeat this regularly until hair is lighter in colour. Radish is as good for your outside as it is for the inside. It is loaded with antioxidants and vitamins that are wonderful for your body. To use as natural bleach thoroughly wash and peel the radish. Grind it along with the juice of half a lemon. Apply all over your dark hair and wash off after 15-20 minutes. Wild Turmeric has been used as a facial hair lightening agent from the ancient times. Regular application of wild turmeric naturally lightens colour pigments in your hair, making your hair appear lighter naturally! Take wild turmeric and make it into a fine paste. Apply it all over your face and leave it for 15 minutes. Then rinse your face with water and pat dry. You might notice a light yellow tint to your skin due to the staining properties of turmeric. Therefore, apply this face pack on weekends or days when you are at home. This is considered as one of the best natural bleach for face hair. This may sound racist in this 21st century but it is the truth that many people still are in fancy to have glowingly white skin. If they are born with it, then no problem, but many people try t get it doing various things and trying various remedies. One of the most important tips in getting a lighter skin is to avoid too much sunlight exposure. It doesn’t matter whether you are using any of your best natural skin lightening supplements. When you expose your skin to UVA and UVB radiations from the sun, it triggers production of melanin a substance that darkens your skin. The best way is to wear sunscreen every time you get to the sun. Putting on a hat and long-sleeved clothing and sunglasses is recommended while walking in the sun. Remember to exfoliate your skin to remove the dead layer of cells. Try to wash your face regularly during the day to remove dirt, bacteria, and oil from your skin. Skin whitening pills are also an option that many people go for. While choosing the pills study the review and ensure they contain ingredients that are certified by FDA as safe and gentle on skin. Follow the application recommendations provided for an effective outcome. While going for pills, it is important to be aware of the dangers and risks of using this method of skin bleaching. Among the ingredient used in making some of the products may negatively affect your skin and body in one way or another. So, do try these homemade bleach for face hair removal and reduce your parlor expenses.